Classic Baked Chicken Meatballs in Marinara Sauce are the perfect Healthy addition to a sandwich, bowl of noodles or veggie noodles! 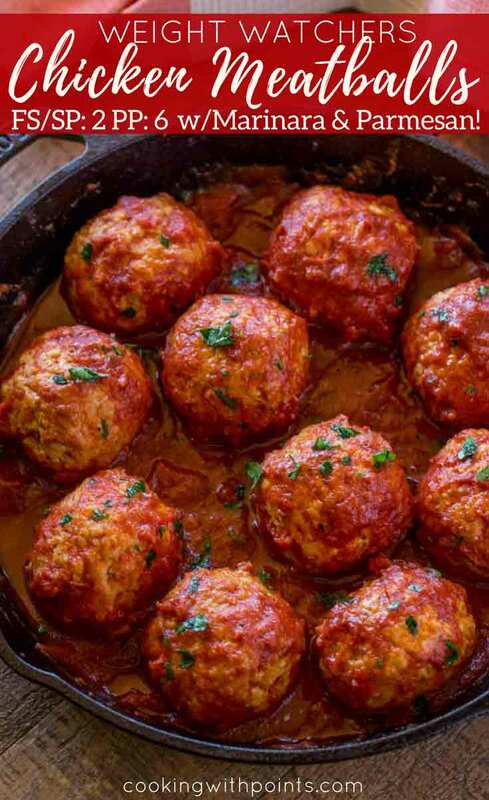 Chicken Meatballs baked in the oven are a quick and easy healthy alternative to the classic beef and pork meatballs. 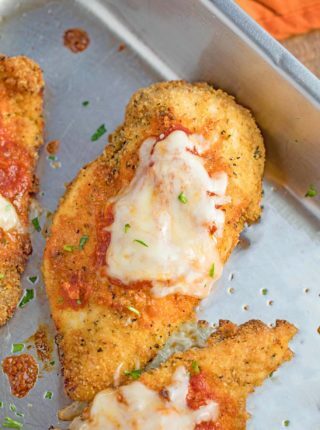 These actually don’t even require any additional oil to bake as we add marinara sauce to it as it comes out of the oven and they release from the pan naturally in the sauce. With just 2 smart points in 1/4 of this recipe you can go to town with these meatballs! One of my favorite meals I find myself craving since being on a diet has been meatball subs. Not that I would eat them so often before, but now I just have this craving for the warm carbs. With these chicken meatballs cutting back on the fat I’ve started enjoying meatball subs again. The way I enjoy them is to find a good high quality hoagie roll (not like the premade hoagie rolls that are the same as sandwich bread) and calculate the points per ounce of the bread. Then I scrape out as much of the soft inner part as I am willing to part with and weigh the remaining bread. Topped with lite mozzarella cheese from Trader Joe’s (this is a true gem of an item for those of us on a diet) and you have a pretty lightened up meatball sub that you’ll still LOVE. Or you know, serve them with noodles or something like a normal person without sub sandwich cravings. Ha! Add them to a hoagie roll for a game time/lunch friendly recipe. Add it over spaghetti squash like this Spaghetti Squash with Meat Sauce recipe. 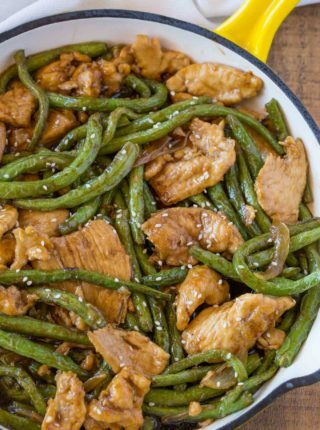 Serve it with spiralized vegetable noodles. Serve with half thin spaghetti and half vegetable noodles to cut down on the points in the pasta. As an appetizer cut in half on crostini with a bit of Parmesan cheese. 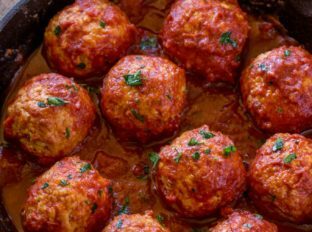 Can I substitute ground turkey in the chicken meatballs? Yes, both ground chicken breast and ground turkey breast are similar in nutritional value, so I would interchange them as you’d like. 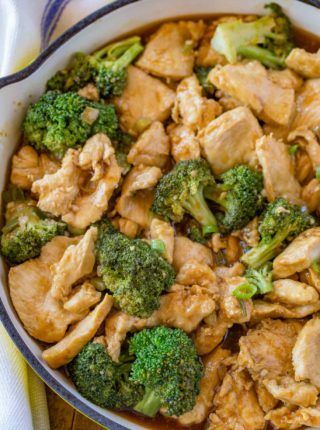 You can also use ground extra lean pork in the recipe but even extra lean pork isn’t quite as healthy. Prepare the meatballs as instructed but freeze on parchment paper lined cookie sheet instead of adding to the pan. When ready to cook, bake them for 5-10 minutes longer or bake for the same amount of time and finish by simmering in the marinara sauce for an additional 5-10 minutes or until cooked through. Marinara sauce can be saved in freezer safe containers. Cast Iron Dutch Oven: The perfect dutch oven for browning then simmering and the lid is the second pan! Crushed Tomatoes: My go to brand for canned tomatoes, the flavors are like fresh. Tomato Paste: I used to use the store brand canned variety but this one is my go to and easier to store. Classic Baked Chicken Meatballs in Marinara Sauce are and the perfect healthy addition to a sandwich, bowl of noodles or veggie noodles! Add the olive oil to a dutch oven on medium high heat. Saute the onion until just translucent, stirring often. Add the garlic and stir for 30 seconds until you can smell it. Add the rest of the ingredients, stir well and simmer, covered on low heat for 20 minutes. Add all the ingredients to a bowl and mix until just combined. Roll the chicken mixture into 12 even meatballs and put them into a cast iron skillet. Spray a quick 1 second burst of olive oil spray onto the meatballs and cook for 20 minutes. Serve the meatballs with the sauce in your desired recipes. I am loving your blog!!!!!!! Just wanted to let you know. I made this today, and it was so delicious. It is the type of meal I thought I had to give up on WW, or eat a sub-par version. This was so great. I got lazy and used my favorite arribiata pre-made sauce, which upped the points a bit – but tearing out some of the bread crumb was a genius idea to lower points and still have a satisfying sandwich. Thank you again! Thanks, Sarah! I’m all about making sure people don’t have to sacrifice flavor in order to eat healthy! Now I’m totally craving a meatball sub! This is such a wonderful winter dinner. Oh my, these meatballs look fantastic!! I can’t wait to make them for my family!! Aww! 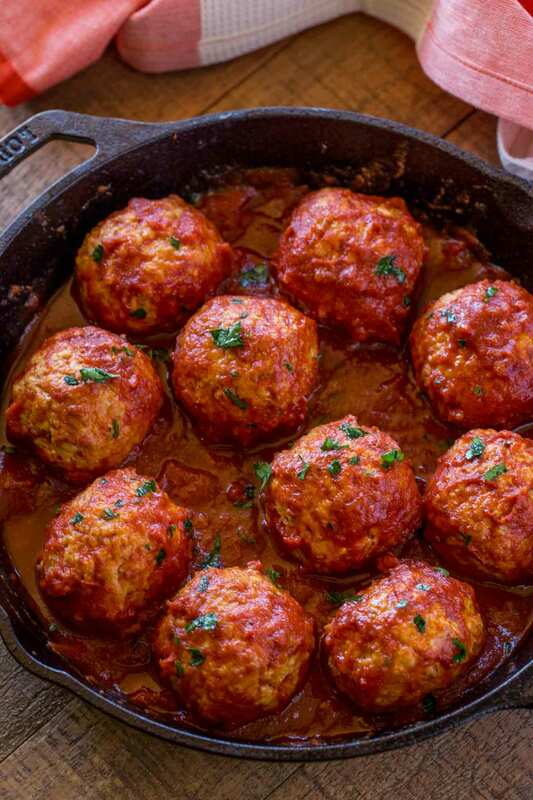 These meatballs look so irresistible! I can’t wait to try this! 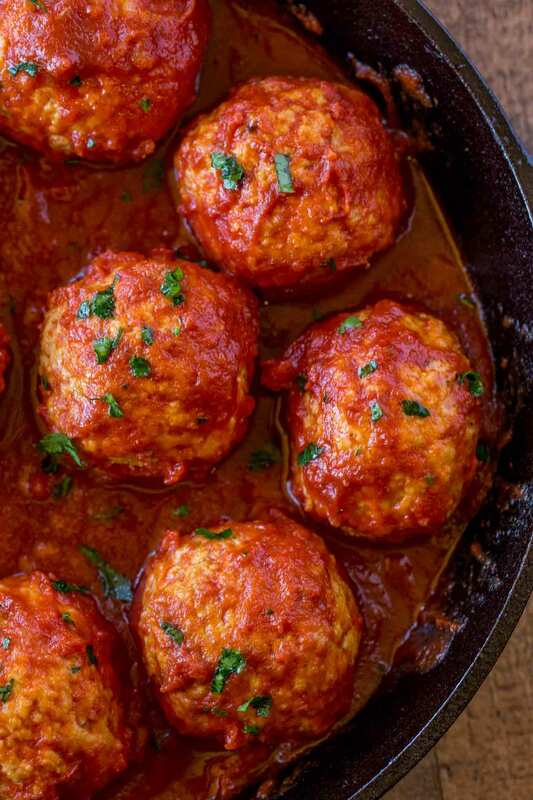 These chicken meatballs sounds and look so good! These meatballs look too good to be healthy! I can’t wait to try them out with some zoodles! So glad your family enjoyed it, Shelly! Thanks for coming back to let us know! 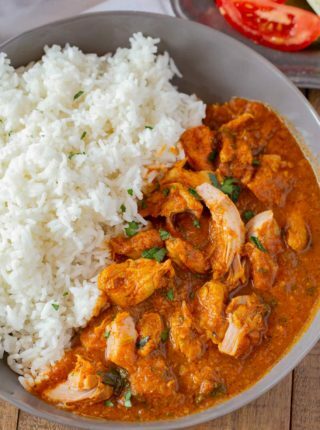 I absolutely loved this recipe. Satisfied those meaty cravings. Getting just a tad tired of grilled chicken. Making this again tonight and I’m already looking forward to the leftovers. Thank you so much Cathy! I’m happy it was a hit! Thank you so much for the review! I love your edits they sound so delicious!